February BMA meeting - What's new in Search Marketing? The Minnesota chapter of the Business Marketing Association (BMA-Minnesota) will host a panel discussion on the latest trends in search marketing. The session will be held on Feb. 14, 2012, at the MetropolitanBallroom & Clubroom in St. Louis Park, Minn. from 8 a.m. to 9:15 a.m.
· Nina Hale, Founder and President of Nina Hale Inc.
Nina Hale and her team have been working with Stratasys for the past year on SEO and PPC. As part of the presentation the panelist will discuss how social media is impacting natural search results (SEO) and what Stratasys is doing to increase its organic search. Additionally, the panelists will discuss specific marketing challenges, what was done, and results, along with insights and learnings along the way. Sponsored by Minnesota’sonly professional organization dedicated exclusively to the needs of business-to-business marketing professionals, the event will be held at the Metropolitanlocated at 5418 Wayzata Blvd, Minneapolis. The program will run from 8 a.m. to 9:15 a.m. with networking and continental breakfast beginning at 7:30 a.m. The cost of the event is $24 for BMA members and $48 for non-members. Attendees can register online at www.bmaminnesota.org through February 10. A limited number of walk-up registration is available. Heather Hayes - As Interactive Marketing Supervisor for Stratasys, Heather Hayes is responsible for the company’s corporate and product web site strategies. She also manages and monitors the performance of the company's SEO, PPC and social media. Under Hayes’s direction, organic web site traffic has increased 30% and PPC conversions 58%. She specializes in merging traditional marketing with online marketing to increase customer interactions with the brands and ultimately conversions. Prior to her work at Stratasys, Hayes worked at Silicon Valley Bank and Evolved Systems. She has been optimizing web sites since 2004. Nina Hale - With over 20 years of experience in marketing, Hale has spent the past 12 dedicated to eMarketing and specifically Search Engine Marketing. She holds an MBA from The Carlson School of Management in Marketing and Customer Service Operations, and a BA from Brown University in American Cultural Studies. Hale is individually certified in Advanced Search and in Reporting in Google AdWords, and has been certified in Google Analytics (GAIQ). Passionate about search and analytics-driven performance media, Hale opened her agency in 2005 as a solo consultancy which soon grew. In the late ’80′s, Hale specialized in traditional and new media when she started her career in computer animation production and radio advertising, then shifted to eComm and online media in the late 90′s. Hale holds a strong background in eComm merchandising, email marketing, and interactive strategy. Proud of her geeky past, Hale boasts that she spent much of 1984 in her parent’s basement chatting on prototype social networks via a coupler modem. In addition to managing her search engine marketing agency, she recently served on the board of the Minnesota Planetarium Society. To pay for a job posted to this site click the button below! 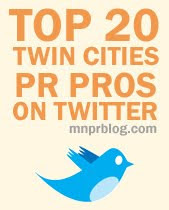 The most recent news, jobs and events in Minnesota Public Relations. MNPR Blog has now teamed with Big Shoes Midwest.